This post was contributed by the NCTE Standing Committee on Literacy Assessment. 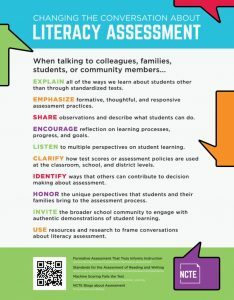 We’ve been writing here about ways to change the conversation about literacy assessment since August, but we know that the most important way to change conversations is to actually have them! We want to talk—and listen—to you about what you are doing in your classrooms and communities to shift the way educators, community members, and policymakers talk about assessment. Our Roundtable Discussions at the upcoming NCTE Annual Convention are a great opportunity for you to let us hear about what you are doing. You’ll also have a chance to engage with other ELA teachers from kindergarten through college to share your classroom assessment practices and to get new ideas for making teaching and learning the focus of assessment. Each roundtable will be focused on a topic and although each will target particular grade levels, all are relevant across teaching contexts and levels. Led by experienced teachers and researchers, the roundtables aim to help us all rethink the role of assessment to improve teaching and learning and identify productive ways to respond to assessment mandates. While we will offer strategies for literacy assessments, information about the pros and cons of various approaches, we are most interested in talking with you about what you are doing. So bring your coffee and start your Saturday with some inspiring conversations about how we can use assessment to promote student learning! And while you are at the Convention, check out our Ways to Change the Conversations poster boards, which are available for free download here. Access the NCTE Convention Program.